Pause for a moment to consider the life of the humble wooden pallet. They’re often seen as disposable, as they can be thrown away after they’ve been used to deliver something. Yet the pallet has so much more to give than just being used as a transport platform and then cruelly discarded. You probably haven’t realised that pallets could be used to help solve the housing problem for refugees. Millions of pallets are used around the world, and consequently there are always plenty of second hand wooden pallets for sale. It’s estimated that a year’s worth of used pallets from the US would be enough to house 84 per cent of the world’s refugees – a pretty startling statistic. If there are enough pallets in the US to do that, then the number of pallets for sale around the world could solve the refugee housing problem with material to spare. Pallets have a lot to commend them as a building material. For a start, there’s a standard pallets size which means that designing structures around their use is straightforward. It also means that assembly is easy. In America you can buy a pack for $75 that gives you all the information you need to build a house from pallets. It includes plans, elevations, photos, a materials and tools list and step-by-step instructions on how a pallet house can be assembled in a day. Pallets have usually been treated to ward off bacteria, fungus and insects, so a house built of them can be surprisingly long-lasting. 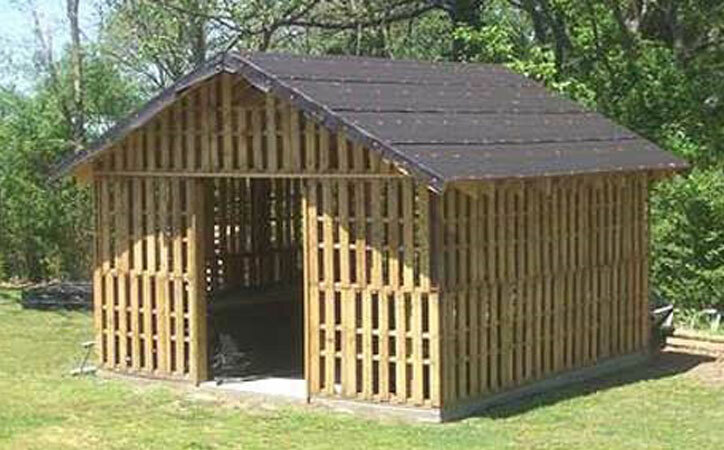 If required, pallet houses can be upgraded using other materials – metal or plastic roofing to make them watertight, for example. They can also have insulation added to make them suitable for use in a wide range of different climates, offering the possibility to turn them into more permanent homes. Using pallets to help solve the refugee housing crisis is a great idea, but they have other uses too. There are always lots of second hand wooden pallets for sale, so they make an attractive option if you want to build a summerhouse for your garden or a treehouse for your kids. While standard plans are available, you can adapt them to suit different needs thanks to their modular nature. The US alone discards 150 million pallets each year. Re-using them to create low-cost housing offers an environmentally friendly option that can improve people’s lives in a very real way.